One of the blogs I follow is from Gunnar Hillert, whom back in 2009 discovered Camel and wrote a nice blog entry. He also did some investigation of Camel alternatives as well. One of the alternatives is Spring Integration. Gunnar has since joined VMWare to be part of the Spring team. 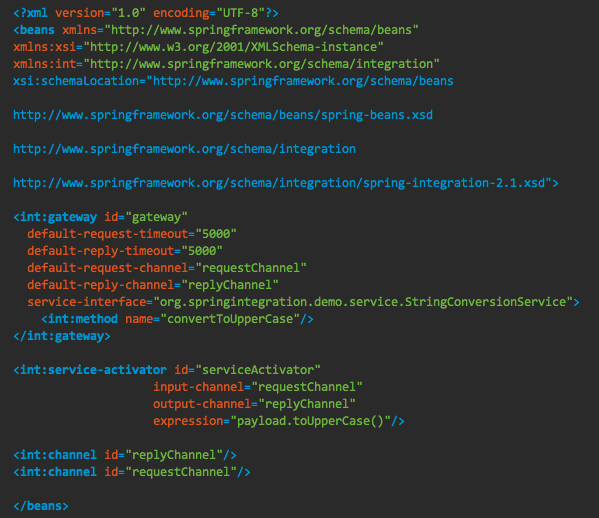 So this morning I read the new blog post by Gunnar on how to create a Spring Integration project in STS tooling, which is posted here. The STS creates a simple out of the box example, that provides the following XML (in screenshot) as the main logic. Take a moment to see if you can figure out what it does. And then compare to the equivalent Camel example below. This example will be provided out of the box in the upcoming Apache Camel 2.10, in the examples/camel-example-console directory. You can see the source code here. And then press ctrl + c to stop the application. Or you can run it from within your IDE of choice, such as IDEA / Eclipse / FuseIDE by running the CamelConsoleMain class. For example as the screenshot shows below from IDEA. To create a new Camel project you can use the Camel Maven archetypes. 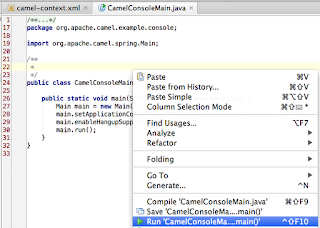 Or use Fuse IDE which has a wizard just like STS to create a new Camel project. A few notes about Camel. 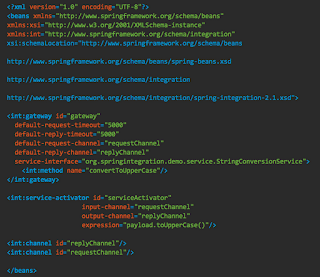 The example uses Spring and XML, however Camel can be used without Spring at all. We could use pure Java and define the Camel route in a Java class. You can also use Scala. And for XML we could also have used OSGi Blueprint. With Camel you simply have more choices, and dont have to use XML at all.